Wondering how I became a full-time wedding photographer? I know what you're going through...what you're struggling with. Hello, my name is Henry and 2018 will be my 11th-year as a wedding photographer, with the past 9 being full-time (where wedding photography was my only source of income). I’m here because I am PASSIONATE about helping aspiring and new wedding photographers, like yourself, achieve their goal of going FULL-TIME. I know what it’s like wondering how to go about making a living in wedding photography when I'm already struggling to get visits to my website and inquiries. How am I going to be able to support myself (and my family) financially with a CAREER in wedding photography? ..I believe there’s something valuable you can find on this website. That is why I am here to help YOU. You will not only learn how to develop YOUR unique business plan but I will also SHOW you how every component of it fits into the 3 most important pillars for success in wedding photography: photography, pricing, and personality. To top it off, you will learn how to have a well-balanced lifestyle working for yourself, make a difference in the lives of brides and grooms with your wedding photography, and actually have time to do other things you’re passionate about. In addition to providing tangible action items for your business, I’m here to give you the “NO EXCUSE” motivation to keep you on track towards lifestyle and financial freedom, with wedding photography as the engine to all of it. I understand we all have our own unique set of challenges to overcome. Some of us are struggling to find even an hour each day to work on their wedding photography business because of their conventional job and taking care of their kids. While others might be wondering how can they invest in quality equipment and a professional website when they’re barely making ends meet every month. And others might be afraid if they truly have the talent and "right" personality to be a wedding photographer. No matter what, there’s something every single one of us can be doing today, RIGHT NOW, that will help us get one step closer to becoming a full-time wedding photographer. I’m here to do whatever I can to help you on that journey. I can’t believe it’s been nearly a decade, but it feels like just yesterday when I took on photography as a hobby in the Summer of 2006. I remember my mom asking me if I’m going to return my Canon Rebel XT DSLR with the kit lens (go variable aperture!) after a few weeks of testing it out, perhaps using it once or twice, before I lost interest and moved onto something else. After all, I just got my degree in engineering, started working as a systems engineer at one of the big defense companies near Los Angeles International Airport, and was about to actually start graduate school (also in engineering). Surely this whole photography thing was no more than a hobby and my career was most certainly going to be in engineering. If anything, buying a camera was a good excuse to go to all these places that I’ve never been to. The Getty Center. What’s that? Santa Monica Beach. Think I’ve heard of it before. Work trips to Washington, DC, and Dallas, TX. Maybe I can squeeze in a few hours of sightseeing? Even though I spent my first two decades living in LA, the farthest place I ever went to was Anaheim (Disneyland! ), minus that one family trip to San Francisco and Las Vegas, which felt like going to a whole new planet. Fast forward a year later to the Summer of 2006, when not only did I end up keeping my Rebel XT DSLR with the kit lens (see mom, I told you I wasn’t going to return it), but ended up as a marketing intern for my beloved Los Angeles Clippers NBA basketball team. What does it have to do with my story on becoming a full-time wedding photographer? EVERYTHING. You’ll see. How did I get this “job”? Not surprisingly, there weren’t too many people that wanted to work 5+ hours for 3-4 times a week in the evening taking photos (with their own equipment), not getting paid (it’s for the experience right? ), and for arguably THE worst team in all of American sports (not exaggerating here). So that intern position was mine for the taking. In addition to working full-time as a systems engineer and going to grad school, I was doing something I never thought I’d do. No, not sitting on the sideline getting an up-close and personal perspective on my favorite game of sports. But actually learning how to use my Rebel XT camera. What’s this M-mode on my dial? How does this Canon 580EX Speedlite work? And why do all these sports photographers sitting right next to me have cameras and lenses that were bigger than me? A 300mm f/2.8 telescope-like lens? A 1DMark what? And how is that one photographer controlling those super bright lights along the ceiling of Staples Center? What sorcery was this? I was more than just the photo intern among the big-time professionals, whose work was featured on NBA.com, Associated Press, and Getty. I was truly a boy among men with my Rebel XT and kit lens. To add insult to injury, all my photos were blurry, dark, and the colors appeared mutilated compared to the real photographers’ work. The sad reality was when I started interning, I thought my photos were fairly good. My curiosity, ambition, and ego got the best of me; I was determined to get better equipment and with practice, hopefully, better photos. With every penny I saved from working as an engineer, I splurged and got a Canon 1DMarkIIN, 70-200mm f/2.8L lens, and later a 5DMark1 with a 300mm f/2.8L IS lens. If you do the math, that’s over $12,000. Wedding photos? Um…what? Safe to say the last thing on my mind was putting wedding and photography together, but I’d be lying if I told you I wasn’t a bit curious. At that time, the only thing weddings and I had in common was my awful impromptu speech at my cousin’s wedding back when I was about 17 years old. To this day, I couldn’t tell you what really got me into wedding photography, or even why I went home that night from the hangout and started researching this topic. To be honest with you, thoughts like “full-time wedding wedding photographer”, “quitting my engineering job”,“running my own business for almost 10 years”, “spending thousands and thousands more dollars on equipment and a website”, “making six figures in my second year as a wedding photographer”, “photographing destination weddings”, or even “photographing ONE wedding” were the last things on my mind. But what I can tell you with 100% certainty is that a faint flame was burning inside of me, one that started well before that comment about shooting a wedding was made. Maybe that fire was always there, or it was influenced by a variety of factors while growing up and becoming an adult. At the very least, it began with my interest in photography back in 2005, coupled with my desire to make an impact in the lives of others, and being my own boss (all those years of listening to my parents and professors were finally getting to me!). We all have our story on what got us into wedding photography or at least thinking about it being a full-time profession. Maybe you’ve always liked taking photos: of your kids, landscapes, food, or just the day-to-day-things, and sharing them on Facebook and Instagram. Then when word got out of what you were doing, family, friends, and their network of people started inquiring about your photography. One thing led to another, and you realized you could make some money doing this. After all, you had to find some way to pay for these expensive cameras and lenses! Perhaps you were recently at a wedding as a bridesmaid, groomsman, or it was your very own (congratulations! ), and you had an amazing experience working with the wedding photographer. Then later when you saw their photos, you were really moved by the images, realizing how you might be able to make that kind of an impact on other brides and grooms getting married. Whether it was the photography or the wedding side that got to you first, there came a time when you put the two together and realized there may be something in store for you. Get to capture unforgettable moments, beautiful portraits, and lovely details, all of which are real and genuine to their truest forms. Have the satisfaction of wearing multiple hats each day, i.e. business person, photographer, organizer, editor, etc. Get to be your own boss, working as much or as little as you want each year. Spend the entire day with two people and all their loved ones, where emotions of happiness, joy, laughter, and romance are never-ending (with a bit of drama :). Learn so much about a variety of cultures, faiths, and personalities of people, bettering your own self through all of it. Provide a product that your customers will look back and appreciate for many, many years to come. One that can share with previous and future generations. Get paid to do something you probably love already…take photos! Become a professional and work full-time (be it 20, 40, or even 60 hours a week) without having to spend $100K+ on student loans and go to 4+ years of school. Have a network of other passionate, helpful, and trustworthy colleagues. If you can’t count on a wedding photographer, then who can you count on, right? So what was your moment of truth about deciding to become a wedding photographer? Or are you still on the fence and weighing the pros and cons? I remember mine being not too long after the phrase “wedding photography” entered my mind around April 2007. ...and my brand (logo, website), and continuing to scourge the Internet every day and night for wedding photography tips, tutorials, and other educational material. By the Fall of 2007, just half a year after even thinking about wedding photography, I was set on doing this as a career. My first wedding was in July when I was hired by a co-worker of a high school friend to shoot their 15-hour cultural wedding. They hired me because of the good word my friend put in for me in addition to seeing my non-wedding photography website, which was filled with mediocre NBA photos, a few model shoots, nature images, and one wedding I second shot in June. I got paid $600 ($300 deposit and $300 check after I delivered the images). I still remember how I felt before I arrived at the getting ready location at 8AM on that Saturday: “What the heck am I doing? What did I sign up for? No way I can do this. I want to go home!” But somehow I pulled through. How? I’ll get to that at another time. My moment of truth, or rather moments of truth, came during those 6 months when I was second shooting for about a dozen or so established wedding photographers, most of which were doing it full-time. I started to see the small impact I was making in the lives of these brides and grooms, none of which I’ve ever met before and will see again. My sole job at these weddings was to work FOR the main photographer and to capture the best photos I possibly could. But I started noticing certain things and feeling a particular way at these weddings I was second shooting: the life, celebration, love, joy, and relationships. How was it that I was a complete stranger to all these people, yet I was given the trust (through the main photographer) to not only witness but CAPTURE them having the time of their lives? I don’t know about other engineers and sports photographers, but I sure wasn’t feeling this way at my regular job or when I was at NBA games. Bless my parents, teachers, professors, and friends, as I wouldn’t have gotten to where I was without them, but at the age of 24, I hadn’t experienced those emotions in their most raw, genuine forms. ...to the point that just second shooting and slowly building up my portfolio wasn’t good enough. I HAD to get to know these couples beforehand and be the LEAD photographer. Taking a step back now…how did I go from no wedding photography experience to getting 20+ second shooting gigs in 6 months and building my wedding portfolio? Why did these established wedding photographers trust me to work with them when I had only photographed one wedding? IF YOU MAKE YOUR BUSINESS ABOUT SERVING OTHERS, YOU’LL ALWAYS HAVE WORK. I can go on and on just this one sentence alone, but I want to get back on track. I’M NO ROCKSTAR WEDDING PHOTOGRAPHER, JUST SOMEONE DOING WHAT HE LOVES AND MAKING A LIVING OUT OF IT. 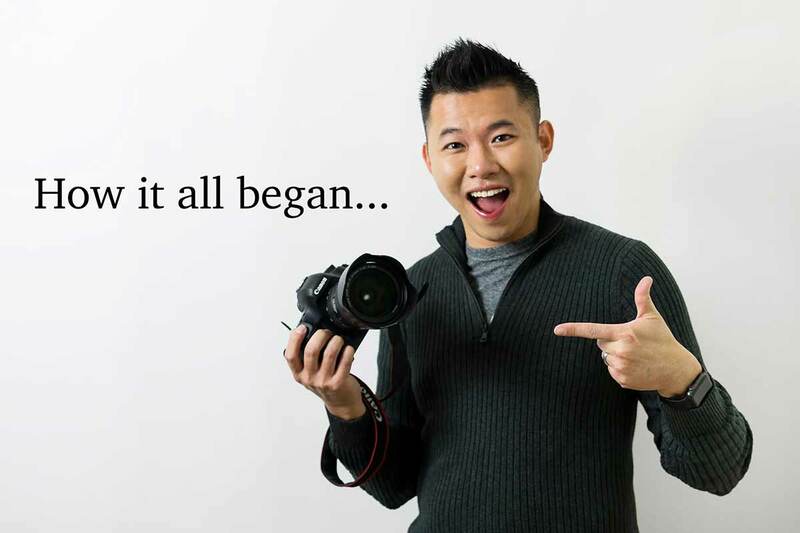 You may think this website is all about starting from scratch and making a ton of money quickly, photographing celebrity weddings, shooting less and charging more, winning countless awards, getting published, conducting workshops, being a leader in the industry, and so forth. Did I “make a ton of money quickly”? Maybe. I was able to gross $50,000+ in my first year as a part-time wedding photographer (2008) and $150K+ in my second year, but things have plateaued off since. Is this a lot of money? Depends on who you ask. It doesn’t matter what I think, it’s more to be completely transparent with you. But also to let you know I’m no $300k+ solo wedding photographer. Have I photographed celebrity weddings? Nope. Perhaps the most high profile one I’ve ever done was the son of a famous female comedian that had her own show in the 90s. The only reason I knew that was because my second shooter told me. And supposedly there have been a few low-profile celebrities in the crowd at some of the weddings I’ve photographed. But as my wife knows, I couldn’t pick out George Clooney wearing an orange suit in a field of green grass if my life depended on it. Have I tried to photograph fewer weddings and charge more? Not really. My starting rate and overall pricing for weddings have been about the same the past 4+ years. Would I love to photograph just 15-20 weddings a year and charge $10k+ each? Probably not (part of it is I know I’ll never be able to get to that level so I’m accepting my own reality). I’d rather photograph 30-35 a year and charge $4-6K+ each. In actuality, I’m a few ticks below that. Am I an award-winning wedding photographer? Absolutely not. Ironically, I won a few WPJA and ISPWP (very reputable organizations in the industry) awards when I was starting out back in 2008 and 2009, and they helped me book a handful of weddings. But since then, I’ve yet to win a single award. None. Nada. The main reason is that I haven’t entered any contests in the past several years, and even if I did, I don’t know how well my work would compare against others. How often has my work been featured/published online and in magazines? Rarely. Similar to the previous bullet point, I had perhaps a dozen online features and 2-3 magazine publications in my first few years in the wedding industry. But since then, I haven’t gotten any of my work featured or published, at least none that I know of. At this point, you might be wondering why on earth you’re still spending time on this website and not hitting that “x” button in the corner. Please bare with me on that. Have I conducted workshops? A few earlier in my career. Notice the trend here? I actually did more wedding photography workshops earlier in my career than in recent years. My first one was literally in my 500 square foot studio apartment with four people back in 2009, where I actually had one of the attendees sit on my bed and another on the floor while I went over my wedding photography workflow. I’ve done a few more locally in Long Beach, CA and one internationally in London back in October 2011, which was my last one. I’d like to conduct more going forward. To be quite honest with you, I’ve just been lazy planning workshops and done a poor job marketing them. Told you I’m going to be very transparent. Am I a leader in the wedding photography industry? Hardly. I’d like to say I’ve influenced a few aspiring and new wedding photographers to pursue this rewarding profession through second shooting/assisting opportunities, workshops, one-on-one mentoring/training sessions, and my social media presence online. But I’ve never given a talk to more than a few dozen people in attendance, created any useful products, written a book, or even really engaged with others online. At the time of this writing, I don’t think more than a few thousand people in the whole world even know who I am, and that includes my parents and wife :). I share with you all my shortcomings not only to show you that I’m really no different than probably 90+% of other wedding photographers but also to let you in on one big secret: you can just be yourself and still have a fulfilling career as a wedding photographer. If you feel like you have a golden opportunity to really stand out from the niche, then, by all means, take that ball and run with it at 100mph. ...and the furthest thing on your mind is how to charge $5000 a wedding when you’re not even getting any inquiries, then it’s time to take a deep breath, step away from the ledge, and have faith that I’m here to be of help. THREE ESSENTIAL THINGS I LEARNED EARLY ON. We all start with zero weddings under our belt, zero client reviews online, and maybe even zero faith that we can actually do this. I sure was there back in May of 2007, and I would say things were much easier then versus now. The wedding photography market now is more saturated than ever before with aspiring, new, and seasoned wedding photographers. It’s so crowded that you can’t even PAY to get advertising on some wedding resource websites because it’s already filled up, with a waiting list not too far behind. Yikes! But despite the growing number of wedding photographers, there’ll always be a market for quality ones. I discovered early on that although I may never reach unthinkable heights as a wedding photographer, i.e. shooting celebrity weddings and giving talks at WPPI, I would still be able to make a comfortable living doing what I was passionate about. So what was the so-called big secret when it came to going from seemingly nothing in the Summer of 2007 to leaving my engineering job and making six figures as a wedding photographer in two years? Shocker right? Sorry to say there’s no magic bullet, but at the same time, these are three fundamental areas that most wedding photographers that are starting out or struggling to book weddings fail to see. Notice the adjectives I used for each item: AMAZING, GREAT, and GOOD. WE ALL HAVE TO GO THROUGH HUMBLE BEGINNINGS, I SURE DID. Before you think that everything just worked out for me from the very beginning, I have to let you know I had my own share of struggles not only when I started out, but even in recent months! It certainly hasn’t been easy. Anyone that tells you can become a successful, full-time wedding photographer overnight with little effort is more than likely set you out to fail even before you begin. ...chances are you’re going to go through the bumps and bruises of starting your wedding photography business. Contacting over 50 wedding photographers and only having less than a handful reply back. Of that, only one giving me the opportunity to assist/second shoot with them…for free. Deciding to purchase another $5k+ amount of equipment at the end of 2007 when I only had TWO weddings booked for 2008. What the heck was I thinking? Applying to be an associate photographer for a budget-friendly wedding photography studio only to be rejected because I had no experience. Losing out on booking a couple because I didn’t have any sample albums to show them. Yes, they literally told me they would’ve booked me if I had a few albums to show them. I NEVER HAD A MENTOR OR COACH TO GUIDE ME THROUGH THE WHOLE WEDDING PHOTOGRAPHY JOURNEY. If only someone provided me with a roadmap, one customized to my own lifestyle and business plans! Buying wedding photography books at Barnes and Noble, studying various wedding photographers work on their website and in forums, and watching tutorials/how-to videos on YouTube, I suppose those were my mentors and coaches. Hindsight is 20/20. Knowing what I know now, would I do things differently if I were to start my business from scratch again? Absolutely. But if I could, would I go back in time and change all my shortcomings, mistakes, and decisions I’ve made? Certainly not. The biggest reason is I’ve learned countless lessons and went through extensive experiences. And now I want to share all of that with YOU. Phew! You made it this far, which absolutely means the world to me. I got into wedding photography in 2007 and it has changed my life completely ever since. Within two years, I was able to do make twice as what I was making in my regular job. More importantly, I was able to live a more fulfilling life knowing that I was making an impact on the lives of my brides and grooms, getting to finally explore this world, and improving who I was as a person. But enough about me, this page and the entire website are more about YOU. I want to help you get the results you’ve always wanted in life, with wedding photography as the catalyst for it all. So NO MORE excuses. There’s something you can do right now and going forward that will help you achieve your goal in wedding photography. Allow me to play a small part in it. There's just one thing I need from you. Who you are and why you want to become/are a wedding photographer. What is your #1 struggle your business right now? How would your life change if you doubled your bookings/earnings next year? I look forward to helping you become a SUCCESSFUL full-time wedding photographer and have it be the engine that helps you live YOUR fulfilling lifestyle. Let's do this!